- в чем становиться лучшим? - за счет чего обеспечивать великолепный сервис? - бизнес-модель или сотрудник обеспечит сервис? - как сделать из клиента соратника? Here’s what we’ve learned: uncommon service is not born from attitude and effort, but from design choices made in the blueprints of a business model. It’s easy to throw service into a mission statement and periodically do whatever it takes to make a customer happy. What’s hard is designing a service model that allows average employees--not just the exceptional ones--to produce service excellence as an everyday routine. Outstanding service organizations create offerings, funding strategies, systems, and cultures that set their people up to excel casually. Our message is simple enough: you can’t be good at everything. In services, trying to do it all brilliantly will lead almost inevitably to mediocrity. Excellence requires sacrifice. To deliver great service on the dimensions that your customers value most, you must underperform on dimensions they value less. This means you must have the stomach to do some things badly. You can’t design a system that is based on the faith that all of your employees will perform heroically, all day, every day, for an indefinite period. For a system to work, excellence must be normalized. And you don’t get to that point by demanding extraordinary sacrifice. You get there by designing a model where the full spectrum of your employees--not just the outstanding ones--will have no choice but to deliver excellence as an everyday routine. You get there by building a system that just doesn’t produce anything else. Heroism can be a red flag. We know a service-recovery expert who comes in early and stays late every day, picking up the slack and overcoming the obstacles in her company’s service design. As long as she’s around, the company will never confront the serious problems they’ve created for themselves, the money they’re leaving on the table, and the growth opportunities they’re missing--to say nothing of the risk of assuming that this employee will stick around. Great service, it turns out, is not made possible by running the business harder and faster on the backs of a few extraordinary people. It’s made possible--profitable, sustainable, scalable--by designing a system that sets up everyone to excel. Once you accept the idea of trade-offs--and break the addiction to service heroes--the inputs into service excellence are much easier to consume. We lay out these inputs in a frame-work we call the four service truths, which are the assumptions behind the basic elements of a successful, high-service model. 1. You can’t be good at everything: You must be bad in the service of good. Excellence requires underperforming on the dimensions your customers value least so that you can over-perform on the dimensions your customers value most. Once you choose this path, the decision on where to be good and bad should by driven by deep insight into who your customers are and what they need operationally. 2. Someone has to pay for it: Service excellence must be funded in some way. You can find a palatable way to charge your customers more for it, reduce costs while improving your service experience, or get customers to do some of the work for you. Choosing among these strategies--finding the right funding mechanism for your business--will depend on both industry dynamics (e.g., price sensitivity) and the specific relationship you have with your customers. 3. It’s not your employees’ fault: Your people matter, but not because they’re the make-or-break input on delivering uncommon service. What matters more is the way you’ve designed your service model, in particular, the way the model sets up average people to excel as a matter of routine. 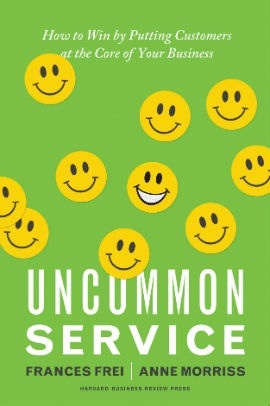 Rather than creating an environment where employees have the time and space to focus on satisfying customers, many service organizations today are actually undermining their people’s ability to serve. 4. You must manage your customers: You must be deliberate about involving your customers in creating--not just consuming--your service experience. In other words, you also need a management plan for your customers. To return to our manufacturing metaphor, the special challenge of service delivery is that your customers routinely wander onto the shop floor--unannounced--and tinker with the assembly line. And yet success isn’t just a matter of keeping them out of trouble. Your customers need to play a productive role on the line itself, and to do so, they need training, guidance, safety goggles--and more. Leadership, at its core, is about making other people better as a result of your presence--and making sure that the impact lasts in your absence. As a leader, you create the conditions for others (in services, that means employees and customers to perform), and you do what it takes to sustain those conditions, even when you’re not in the room. Designing good systems is part of this “absentee leadership,” but the most powerful tool you have, by far, is culture. Culture not only guides individual decision-making, but also provides the foundation for all other organizational behavior and action. In other words, culture doesn’t just tell you what to do--it shows you how to think. Each factor in our service-excellence equation is weighted equally, which allows for some wiggle room. A stronger culture can partly make up for a weaker design, and vice versa. But if either one is neglected, you’re stuck. Excellence is definitively beyond your reach. With either path, you can build an organization that truly reflects your humanity, one that can shamelessly deliver uncommon service.